It was cold. Frost hardened the Earth a month earlier. For two days, snow fell uninterrupted, and then the curtain of flakes lifted with the clouds. Nothing could be heard in the silence but the trudge of our wading boots and the whistles and snorts of elk. Bedded down on the hillside, dusted with snow, they peeped through the sagebrush and watched us walk the trail to the Yampa River tailwater below Stagecoach Reservoir. It was a morning at the end of December and after the revelry of New Year’s Eve; the gate would close, signaling no vehicles on the access road until after the spring thaw. Paul Russell, a long time guide with Steamboat Fly Fishers, set up two-]fly rigs for his clients. A size 20 Pale Morning Dun and black RS2 dangled below a white Thingabob on 6x tippet. “The rainbows are deep in the pools. Keep your nymphs as close the bottom as possible,” he advised. Ten months later he recalled, ”Boy, we caught a lot of fish that day.” The size and deep bold colors of the rainbows dimmed the memory of cold, wet hands. The tail water recently received a major habitat restoration. Heavy angler use had created soil compaction streamside, prevented riparian habitat growth and then high water channeled down the pathways causing erosion. The rich organic soil material tumbling into the river settled and provided suitable habitat for tubifex worms, the intermediate host in the life cycle of the WD parasite. Atkinson is still supplementing the rainbow trout population by stocking German strain whirling disease resistant 2″ to 3″ fingerlings to offset predation from an expanded brown trout population. 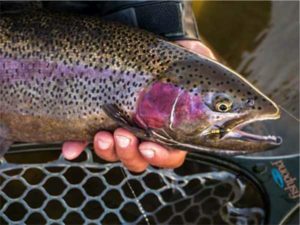 In an effort to develop a brood stock of this unique rainbow strain, which exhibits a higher level of resistance to WD, the CPW is closely monitoring and managing the brown trout population in the 7-mile reach of river between Stagecoach Reservoir and Lake Catamount. Part of the management of brown trout has involved low-level relocation from certain reaches within this section of the river. I like it too, year round. I volunteered for that fly fishers club project with my toddler son, in a child pack, on my back. It began a lifelong love affair with the area for both of us. During the winter, I ski along the Pleasant Valley Road, County Road 18, to fish the river. When I take my dog along, I need to curb his enthusiasm when snowmobiles pass by. For angling during January and February, red, black, olive and gray are the best midge colors. I change colors often, and it seems to help. Try small eggs and San Juan Worms too. By March, the rainbows are approaching spawn; they leave Lake Catamount and become very active. Nymphing the deep runs is still the best bet, but the tail end of riffles and seams hold fish too. Small black stoneflies or a black Copper John with a worm or a midge pattern will take trout. 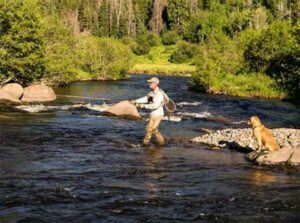 Very big fish swim by Sarvis Creek in the spring time and a streamer with a slow strip can produce the fish of a lifetime. Be gentle, release them to make more little rainbows and avoid wading in their spawning redds. A conehead Muddler Minnow, a sculpin pattern, with a dead drift, bounced a bit on the bottom and then a downstream swing can liven up a slow day, year round. Work the well-oxygenated water from bank to bank. The trout stay deeper for protection on blue sky days. On cloudy days, Steve likes the color chartreuse. Blue wing olive mayflies become active in April and May, but they’re always somewhere in the water column. angling can be excellent. Also try attractor stonefly patterns, like a Mercer Stone, as the lead fly trailed by a PMD emerger. From July to late fall the tailwater sees more angling pressure, and I try to go fishing during the evenings after work. 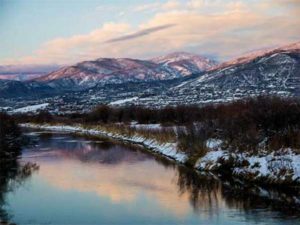 My children are adults now, but I have fond memories of picnics and them wading, splashing and playing in the shallow, sandy Sarvis Creek near the Yampa River confluence. Immediately after Sarvis Creek, the Yampa squeezes between a steep hillside and a rocky cliff to the new conservation section. The morning of the ceremony, the debris-choked; across river fence was removed by volunteers, including me. Later I hooked and landed a brook trout that filled my net on a cone head Muddler Minnow. It was a lovely introduction to a new fishing hole. The BLM public access reach continues down river until just before the Yampa flows into the private water and ranches of Pleasant Valley. 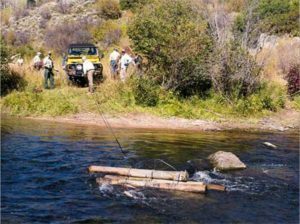 Several ranchers lease angling access to the fly shops in Steamboat Springs and regional fly fishing clubs. I hopped on a snowmobile and followed guide Steve Henderson across snow-covered ranch meadows to a private stretch of the river. Crisp morning air, blue skies and blinding bright snow greeted us. Majestic cottonwoods, stripped of leaves, stood confidently bare in the splendid late March morning sun. A bald eagle sat in high branches watching us and the river. Steve suggested taking two rods, one for dry flies and another for streamers or larger nymphs. The early runoff from Morrison Creek caused a bit of turbidity. “No worries, I know where the deep parts are,” he said. landed a deep bodied, brightly colored rainbow and implied it was a Lake Catamount resident moving up for the spawn. In two hours, with Zen-like calm, he caught and released several rainbows and a few brown trout with a mixture of flies including a chartreuse egg pattern, a red San Juan Worm, a yellow Mercerfs epoxy stone and a green Dahli Lama. The smallest trout was about sixteen inches. The next public section below Lake Catamount is the Chuck Lewis State Wildlife Area. It’s named in memory of a skier, rancher and chairman of the Colorado Wildlife Commission. Colorado Parks & Wildlife manages all the SWAs to protect wildlife habitat and provide recreational opportunities. Most were purchased using sportsmen’s dollars. 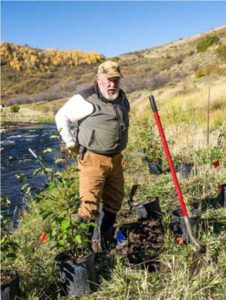 In 2002, the Yampa Valley Fly Fishers and it’s 501(c)(3) Yampa Valley Stream Improvement Charitable Trust committed to partnering the Chuck Lewis Project with the then Colorado Division of Wildlife. 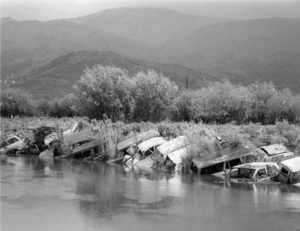 The previous owner of the ranching parcel armored the Yampa’s banks with derelict automobile bodies in an attempt to control erosion of the surrounding hay meadows. Indeed, it was successful. Turn onto Colorado 131 from US Highway 40 a few miles south of Steamboat Springs. Just as the road curves around the Haymaker Golf Course leave it and drive straight to the visible Gilroy Bridge. There is a paved parking lot for recreational use next to the river and bridge. The Yampa flows in the Chuck Lewis SWA above and below the bridge. I fish there frequently, and the hardest decision is to go upstream or down. Upstream features deeper water flowing through boulder vanes. The trico hatches in August, and early September can be epic. I’ve seen blizzards of the bugs flying up the river. For the best results, fish trico patterns drowned along deep seams below the vanes. Caddis flies are active in the evenings and the afternoon on cloudy days. Hopper-dropper combinations produce well too. Try Pheasant Tails, Caddis emergers, flashbacks and Copper Johns. I usually land more rainbows than brown trout above the bridge. generally streamers the best. Predacious brown trout lay in 2 to 3 foot of water looking for an easy meal. Dead drift the streamer to the bottom and lift it on a swing with the current. An angler needs to surprise trout for a reflex feeding reaction. Keep moving along the river or change to a different colored pattern. A second parking lot is across Gilroy Bridge and a right turn, north on County Road 14. From this parking area, an easy, short walk, through a sloping hayfield puts anglers on more downstream water. Frequently red foxes play in the crystalline, winter snow and flocks of Sandhill cranes apparently love the edges of melting snow on the hayfields in the spring. It’s a wildlife area everyone can enjoy. downtown. Stewardship, volunteering, and grants have produced an exceptional fishery. 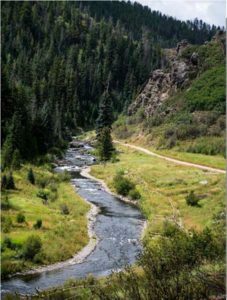 In 1985, the Colorado Division of Wildlife (now the CPW) electro-shocking study produced just 17 trout in a river section in the Town of Steamboat Springs. 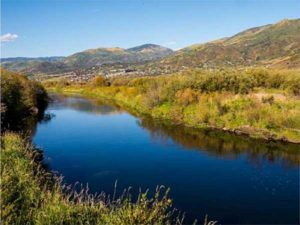 The same year, the Yampa Valley Fly Fishers club also received a grant from the Steamboat Ski Corporation to improve trout habitat, in that section, from what is now Dr. Rich Weiss Park to 5th Street. Additional grants from the Chamber and Summer Marketing committees were received for stocking and educational signage and brochures. The Division imposed a two fish limit to protect the resource, the first special limit regulation in the area. In 1990, the electro-shocking study in the same location produced 165 trout, nearly a ten-fold increase in five years. Today, it is Fly & Lures and Catch & Release only. This reach is within 100 yards of US 40 but still feels remote and secluded. The City created and maintains a paved bike and walk trail which gives an angler total access to the river through the entire town. Please wade in the river or use the trail to prevent streamside soil compaction and erosion. Tubing, stand up paddling and swimming in the Yampa through town are very popular midday activities during summer. All users need to share the resource with patience and etiquette. stoneflies hatch on a regular basis. PMDs hatch in the morning before the tubers fill the river and Green Drakes in the evening after most users leave for other activities. A small stonefly or attractor nymph as lead flies and with PMD or Barr emerger trailing is a good combination. community project with grants from Steamboat Ski & Resort Corp, Yampa Valley Community Foundation, Norwest Bank, YVSICT and volunteers from the Boy Scouts, YVFF, family friends and the Division of Wildlife. Nathan received the “Youth Philanthropist of the Year” award. Later in high school, Nathan gave a speech titled, “My Biggest Community Influence: Bill Chace is the Lorax,” referring to a Dr. Seuss character concerned about the environment. When: The tailwater is fishable year-round. The Chuck Lewis and downtown stretches are usually frozen between December through March. Access: Walk-and-wade river with a City maintained bike/walking trail, Chuck Lewis SWA County Road 14, Tailwater County Road 18 with ski or snowmobile only in the winter from Pleasant Valley. Appropriate Gear: 4-wt to 6-wt 9.0 foot rods 3x to 6x tippets. Useful fly patterns: Adams, Elk Hair Caddis, Blue]Wing]Olives, assorted colored midge patterns, Prince Nymph, Pale Morning Duns, Conehead Muddler Minnow, streamers, hoppers. Necessary accessories: Waders, net, polarized sunglasses, sunscreen, water, hat & coat for season. Maps: Colorado Atlas & Gazetteer by DeLorme Mapping, Trails Illustrated Topo Maps #118 Steamboat Springs.